One test stands between you and a place at the medical school of your dreams: the UKCAT exam. 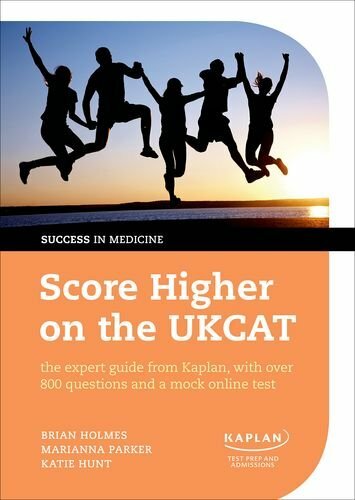 Score Higher on the UKCAT offers unrivalled expert preparation with more practice questions than any other book and a unique online exam - this is all you need to succeed and enter medical school. One test stands between you and a place at the medical school of your dreams: the UKCAT. Unlike any other exam candidates have faced before the UK Clinical Aptitude Test is incredibly challenging, but help is at hand to prepare, build your confidence and reach a high score. Score Higher on the UKCAT offers complete and targeted expert preparation written by teachers and doctors who have helped thousands of students to prepare for the exam. With a greater number of practice questions than any other book including a unique online test, this guide offers invaluable tips on to how interpret the questions correctly as well as strategies to manage your time within the exam. Following an introduction to the exam itself, readers can undertake a diagnostic test at the start of the book to get a flavour for the exam and identify where they may need extra help. Chapters dedicated to each section of the UKCAT guide candidates through examples, exercises and timed practice sessions so that you can master questions in: BLVerbal Reasoning BLQuantitative Reasoning BLAbstract Reasoning BLDecision Analysis The book concludes with a mock practice test as well as advice for test day. Access the online resource centre at www.oxfordtextbooks.orc.uk/holmes_ukcat to answer practice questions, complete a Kaplan online mock test and to stay up-to-date with the latest UK Clinical Aptitude Test specifications.